It took me 90 minutes to get from the CBD to Johnsonville. 30 minutes ago SH1 was stationary going past Johnsonville. Suggest anyone there stay there for now. The side roads are all gridlocked, I went via old hutt road, then up to the left, towards Melvina Major, off to a side road and cut down to JV road. So most people would've taken longer. MF, if you want to know how the motorway looks just txt, I can wander out back and check for you. Many of the monitoring websites are down. Perfect illustration why we need Transmission Gulley road ASAP and new Petone - Granada road. Scotdownunder: Perfect illustration why we need Transmission Gulley road ASAP and new Petone - Granada road. I would think that drainage on people's homes would come first. I'm not sure that Transmission Gully will be guaranteed to be free from flooding and/or slips. We need the Petone Hovercraft! Seriously, I think there are a lot ot of competent engineers in our Councils. But, what the hell is going on in our major cities. Auckland.. deeply in debt, house bubble etc.. , Wellington.. like this.. Christchurch (home), deeply in debt, stalled rebuild, also flooding areas. I'm on a saturated (no pun intended) cable connection in Wellington. 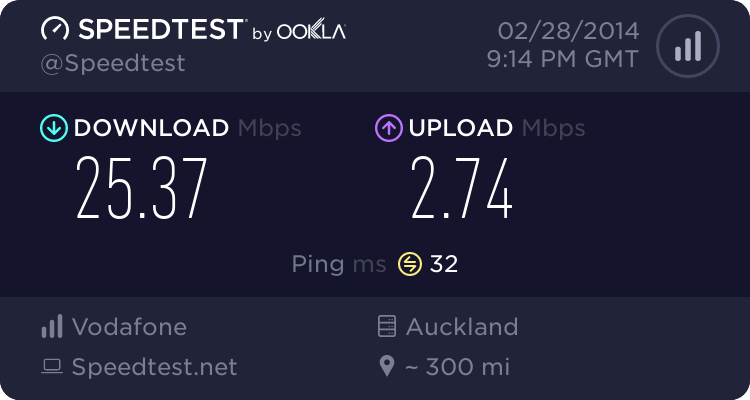 Normally my speeds plunge after 6 pm. Tonight I'm getting full downsteam speeds for the first time this year. Possibly because a lot of people haven't got home because of the flooding? JWR: But, what the hell is going on in our major cities. Auckland.. deeply in debt, house bubble etc.. , Wellington.. like this.. Christchurch (home), deeply in debt, stalled rebuild, also flooding areas. That would be too much liquidity, too much liquid and too much liquefaction. Transmission Gully itself starts a way up doesn't it? So it may have helped with the SH1 slip, but you'd need a feeder road to get the full benefit. Are people who work in town planning on going in tomorrow? I'm considering working from home but I have an appointment in town that'd be difficult to cancel. I don't think there is any question of bad drainage and engineering. It's almost certainly due to blockages from debris (rocks, mud, trees) filling the drains. It doesn't take much rain for us to see more debris at the bottom of the hillsides.